The Hyatt Regency in Trinidad is a true oasis in the island’s capital Port of Spain. Enter the Hyatt Regency--sleek as a rainbow trout, with a genuinely friendly and dedicated staff—and you’ve found an ideal home away from home. During a one-week stay to celebrate Carnival, we found the hotel to be wound up like a well-tuned top. It simply didn’t miss a beat. From one of the island’s premier carnival parties: LIME; to cleaning up scores of early morning, mud-covered, tipsy guests returning from J’Ouvert; to hundreds of other details, it makes one wonder how much better it could be on a normal, non-carnival day. 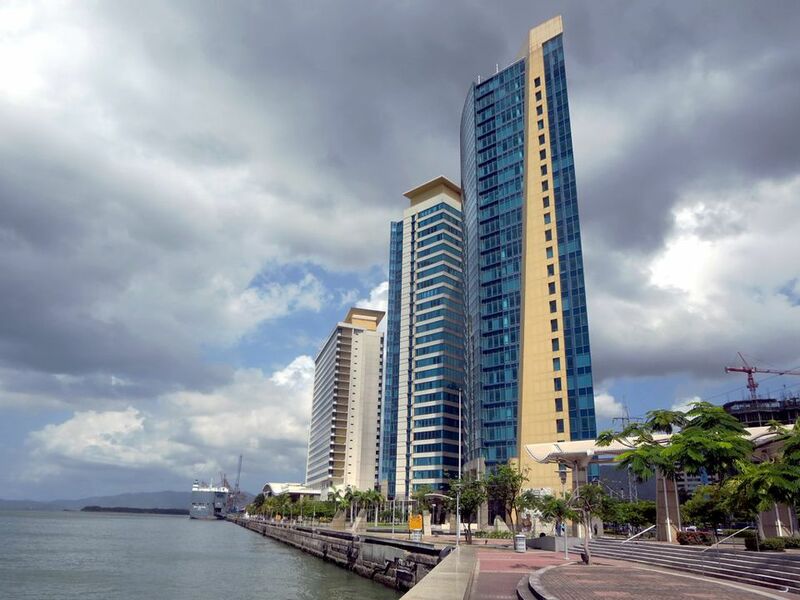 This 22-story high-rise hotel is part of the Port of Spain International Waterfront Development overlooking the busy Gulf of Paria, offering visitors and local residents access to the waterfront for the first time in Trinidad's recent history. It's mesmerizing to sit in one of the many venues in the hotel that offer views of the water and watch the traffic cruise by, including the ferries that link Trinidad with it’s beautiful sibling, Tobago. There are 428 guestrooms, including 10 suites, designed and decorated with a contemporary vibe, including bamboo flooring (a renewable resource), flat-screen TVs, WiFi and high-speed internet access, comfy Hyatt Grand Beds, iHome Stereos with iPod docking stations, quirky mid-room glass-enclosed showers or baths, and deluxe Portico bath amenities. Rooms with views of the Gulf of Paria and the waterfront are the way to go. Suites are basically two regular rooms combined, and corner rooms/suites offer even more expansive views. All rooms are entered through indoor corridors. If you feel like splurging, go for the Presidential or Diplomat suites on the 22nd floor, where you can wave to your pals in nearby Venezuela. Check the hotel's website for special packages and deals. You can dine in grand style at the hotel’s Waterfront Restaurant, which serves breakfast, lunch and dinner. In the lobby, the Sushi Bar dishes out some of the best sushi and sashimi you'll ever encounter. Lunch and drinks at the Infinity Pool Grill is a great way to catch a few rays and get to know your fellow guests in an informal atmosphere. Try the mango smoothies -- very smooth, and healthy too. Just add a little rum and off you go. The Cinnamon Deli and Patisserie, just off the lobby, is a convenient place to grab a good cup of coffee and a sweet treat. And, there is always 24-hour in-room dining if you're feeling reclusive -- or romantic. The snazzy rooftop infinity pool is the gathering place for families, friends traveling together, honeymooners and fellow guests who might be here on vacation or for business (the hotel's 43,000 sq. ft. meeting and convention facilities are the most extensive in the English-speaking Caribbean). The 24-hour StayFit gym has an impressive array of cardio machines and weights in case you want to work off some of the mango/rum smoothies. The Hyatt's 9,000-square-foot Spa Esencia has a unique way of welcoming guests. Instead of changing in a locker room and waiting in a lounge in a bathrobe, each of the six suites has its own changing area and shower. Try one of the spa's signature treatments: the Cocoa Bean Body Scrub, which will leave your "new: skin gleaming like a freshly minted carnival float. There is also a couple’s suite where you and your significant other can relax and be rejuvenated together. The Regency Club is located at the lobby level of the hotel and provides a convenient location to meet business and travel companions. This private club offers concierge service, continental breakfast, and evening hors d'oeuvres and cocktails. One can swoop in during the day and evening for a freshly baked cookie or to read a newspaper or to watch TV. The top three floors of the Hyatt Regency Trinidad have been reserved for Regency Club accommodations. Port of Spain is a patchwork quilt of a city that offers, among other delights, gorgeous examples of colonial architecture, a very active waterfront, and what is purported to be the world's second-highest grossing Kentucky Fried Chicken outlet. English speaking visitors to T&T are in luck, since this is the official language of the dual-island nation.